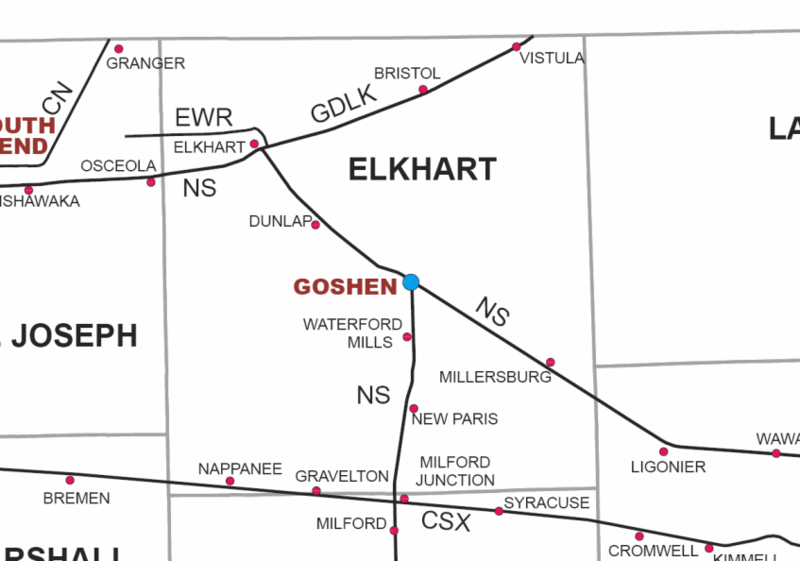 Focus on logistics and improved road systems continue to make Elkhart County, Indiana, a quality and easily-accessible location in the Midwest. 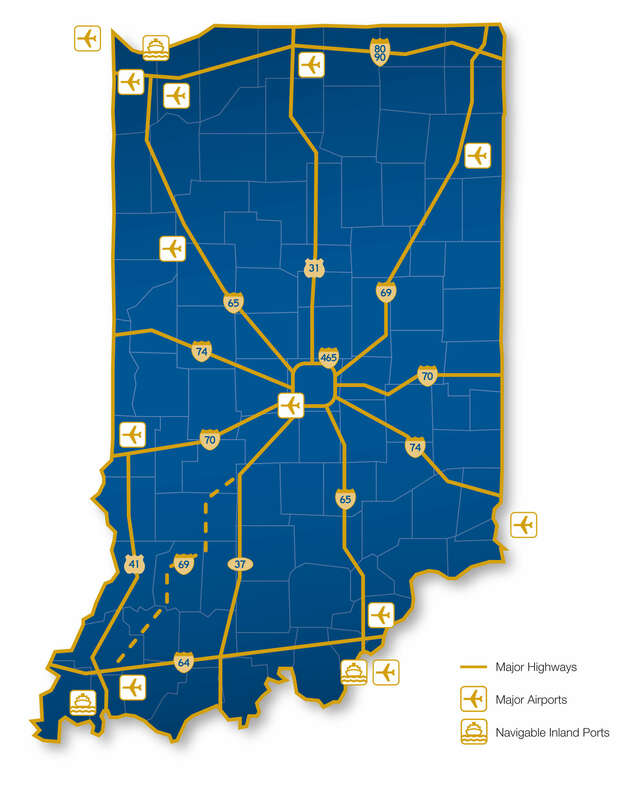 Interstate access via I-80/90 provides four interchanges to Bristol, Elkhart (2) and Middlebury. State and county roads are designed to aid and support the flow of business. Railroad access — including both mainline and shortline — have been recently upgraded to meet the increased demand for product. Port access to Burns Harbor, Port of Indiana, is within 75 miles of the County, providing year-round waterborne shipping access. 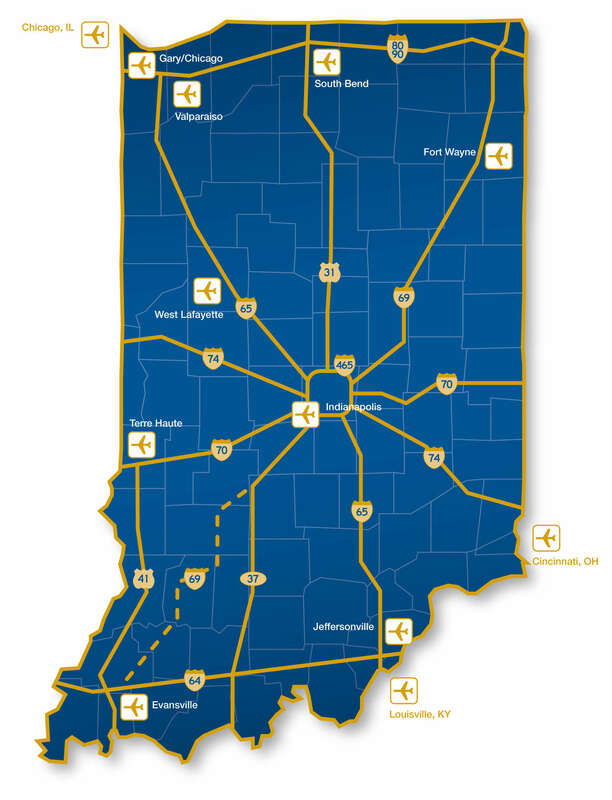 Indiana and Elkhart County are national leaders in logistics. 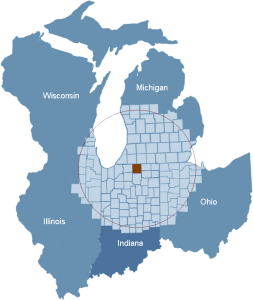 Indiana is in the median center of U.S. population with the distribution advantage that 90% of the U.S. population is within a days drive of the state. 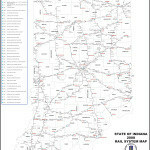 In fact, Indiana as a whole has more pass-through Interstates than any other state in the nation. It also ranks 1st in pass-through truck tonnage, 11th in trucking employment and 11th in number of trucking companies. 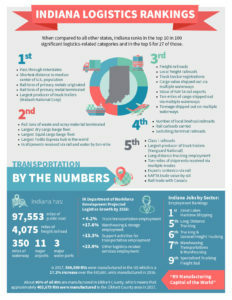 In the latest “Cost of Doing Business” rankings by CNBC, Indiana ranked 3rd in transportation, which helped it attain a 2nd overall for “lowest cost of doing business”. 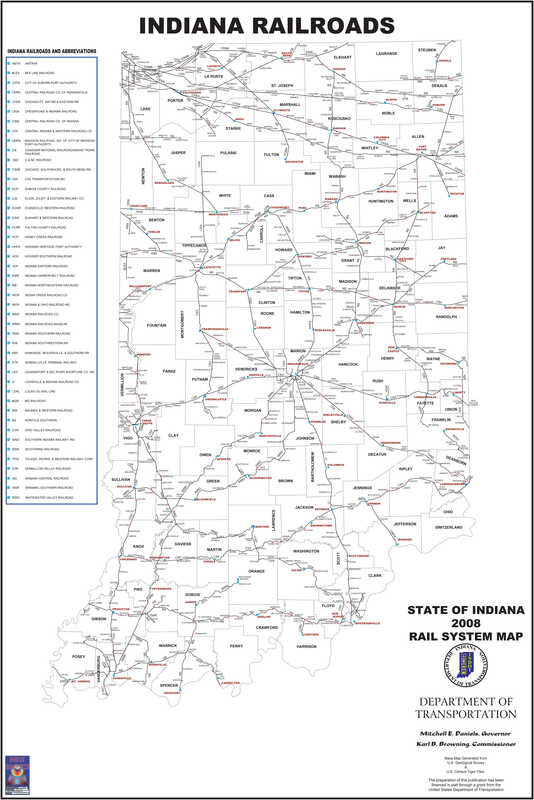 Indiana ranks only 38th in geographical size, but ranks 4th in the number of rail carloads, 5th in number of railroads and Class I railroads, 9th in most rail miles and 7th for the most rail tons of freight originating in the state. Indiana, in fact, ranks 1st in rail tons of primary metals originated and terminated, 4th in rail tons of food products and 7th in rail tons of coal originated and terminated.. Elkhart County has 4 railroads; and the Elkhart Rail Switching Yard is the 2nd largest Norfolk Southern Rail Yard in the nation. 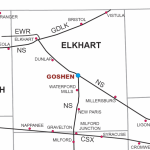 Elkhart is only 68 miles from Burns Harbor Port, and it is via Interstate 80-90 all the way. Burns Harbor is the largest port on the Great Lakes, with capability of direct shipment to the Gulf of Mexico and the Atlantic, and has rail service from all Class I Railroads. 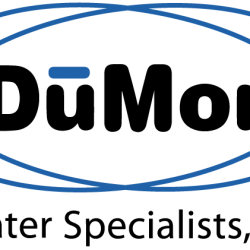 Via the St. Lawrence Seaway and the Inland Waterway system shipping can go directly to Michigan, Ohio, Pennsylvania, New York, Kentucky, Tennessee, Alabama, Mississippi, Louisiana, Arkansas, Missouri, Oklahoma, Kansas, Nebraska, Iowa, Wisconsin, Illinois and other parts of Indiana. Indiana, as a whole, ranks 11th in the nation in water-borne shipping and 6th in U.S. domestic waterborne traffic. Indiana is served by two other ports in the southern part of the state. Indiana is one of only 8 states that have multiple airports in the top 50 for air cargo; Indianapolis is 7th (ahead of both JFK and Dallas/Fort Worth) We also rank 9th in the number of airports, two of which are close by: Elkhart and South Bend.